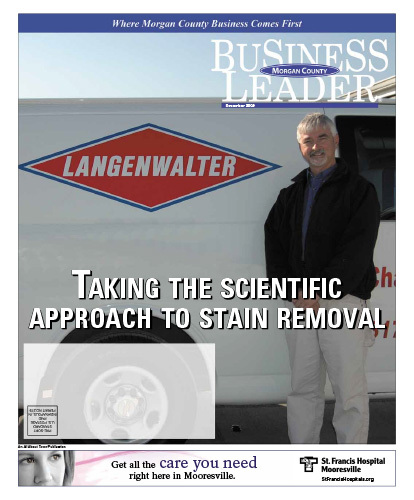 If you have carpet problems, you should call Langenwalter Carpet Dyeing Inc. Mark Mauck, owner, was what you might call a “clean up” man for many years. “I left IDEM after 13 years of being a first responder for spills and environmental cleanup. Since that job required me to be on call 24/7, it just wasn’t working for this family man. I wanted to be home more with my wife and our two daughters. So I went to work for Langenwalter Carpet Dyeing of Indianapolis for a couple of years, and in 1997, decided to start my own division of Langenwalter Carpet Dyeing. My partner Chris Wright and I had worked together on many jobs and developed a great working relationship, as well as a great friendship. We went separate ways for a while, but always kept in touch and eventually began working together again,” recalled Mark. Download the full December 2009 Edition here.